Dog Mountain is one of the most popular spring hiking destinations in the region. 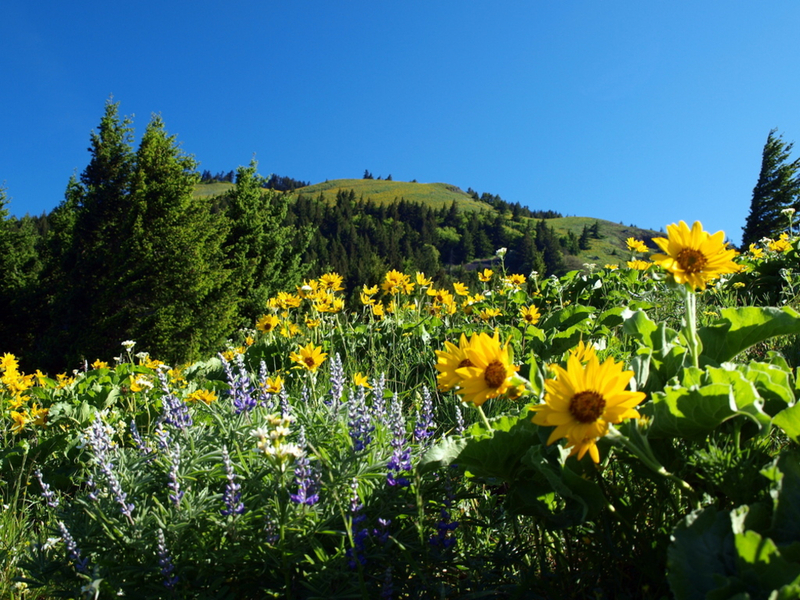 Considered an annual pilgrimage by many hikers, the upper meadows of the mountain explode with colorful wildflowers in May and June. For many, hiking Dog Mountain is a tradition. For others, it’s a celebration of spring featuring one of the best wildflower displays in the gorge. Team all of that up with picturesque gorge views, and you’ve got a recipe for an amazing experience, but pretty crowded parking lot. If you’re hiking Dog Mountain on a sunny May or June weekend, prepare to get acquainted with several of your outdoor-loving neighbors. If you prefer to have the trail to yourself, leave early on a weekday. The hiker should start from the Dog Mountain Trailhead and begin on Trail #147 for about .7 miles. You will see two options here labeled “more difficult” and “less difficult.” There is no benefit of going up the “more difficult” route unless you want to challenge yourself that much more. Not only is the “less difficult” option still a challenge, but it also offers some amazing views along the way. After just about a mile, there is a viewpoint that offers a great view of the gorge. After about another half mile, the trails meet and it gets a little steeper, but remember that the end of the hike will be worth it. Near the top, there is a loop and the main trail continues left. Continue to take the trail up until you get to a flat area that is perfect for a summit photo and break before the trek back down. This trek is challenging, but that sudden elevation gain brings you to one of the best views the gorge has to offer while you sit on top of a mountain that is covered in wild flowers in May and June. For food and drink after this rather challenging hike, Backwoods Brewing Company in Carson is an excellent option. One of the newer faces on the microbrew scene is also one of the finest. Backwoods has great food, great service, and great beer. It’s a no-brainer. The hiker should know that this is not a casual hike. 7 miles and nearly 3000 feet of elevation gain are the toll that must be paid to enjoy the mountain's riches. It's worthwhile anytime, but catch it when the wildflowers are blooming and it's as good as it gets. 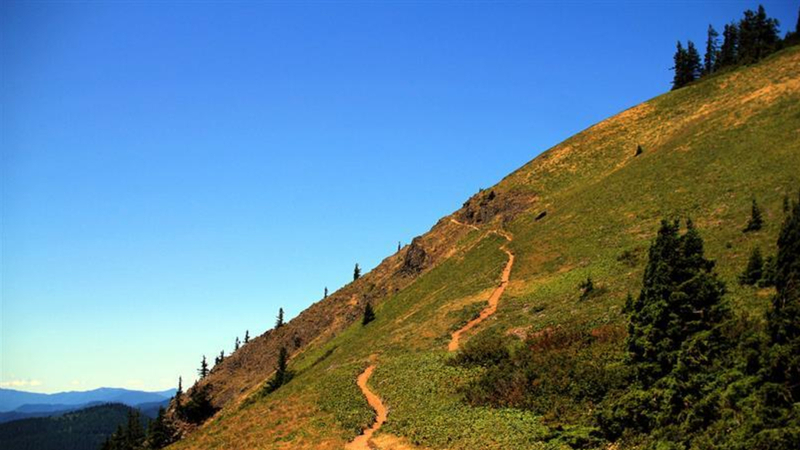 For experienced hikers, this is a great way to spend a day hiking up a challenging mountain to sweeping views of the gorge and a multitude of colorful wild flowers while you train for bigger, steeper hikes. For less experienced hikers, this is a good hike to test your limits. Take your time and plan for many breaks as you make your way up the steep mountain. You can be sure that you will find the struggle worth it once you reach the top. To get to the Dog Mountain Trailhead, take I-84 east and cross the Bridge of the Gods into Washington then turn right on highway 14. The trailhead is at milepost 53 and is a turn off into a dirt parking lot. The trail is off to the right.